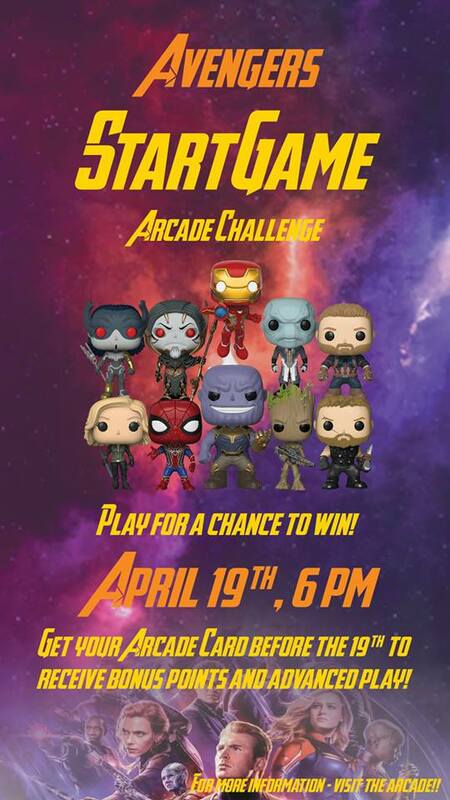 Frank Theatres CineBowl & Grille presents the Avengers StartGame Arcade Challenge debuting on Friday, April 19, 2019. Want to win 30 Avengers Funko Pop Vinyl Collectors? We are very excited to bring a fun and rewarding challenge to the many loyal arcade and movie fans! We wanted to offer a prize that you would not see every day and in this case, probably never again. Not only will you get the satisfaction and thrill of the challenge, but one lucky gamer will walk away with prizes that will grow in value and respect. Please join us on Friday starting at 6:00 pm on the snap for the start of gaming. This will be a ticket race to 11,022 in honor of the 2nd film in the Marvel series, Avengers Endgame. There will be only one winner that must be won during normal business hours and verified by a manager. A new game card will be issue specifically for this challenge. You will not be able to use a current card. To view the event flyer, visit: https://i.imgur.com/9Wip8Pt.jpg. For more information, visit: http://blacksburg.cinebowlandgrille.com or https://www.facebook.com/BlacksburgCinebowlGrille or https://www.facebook.com/events/330912570898430/ or call 540-750-4588.